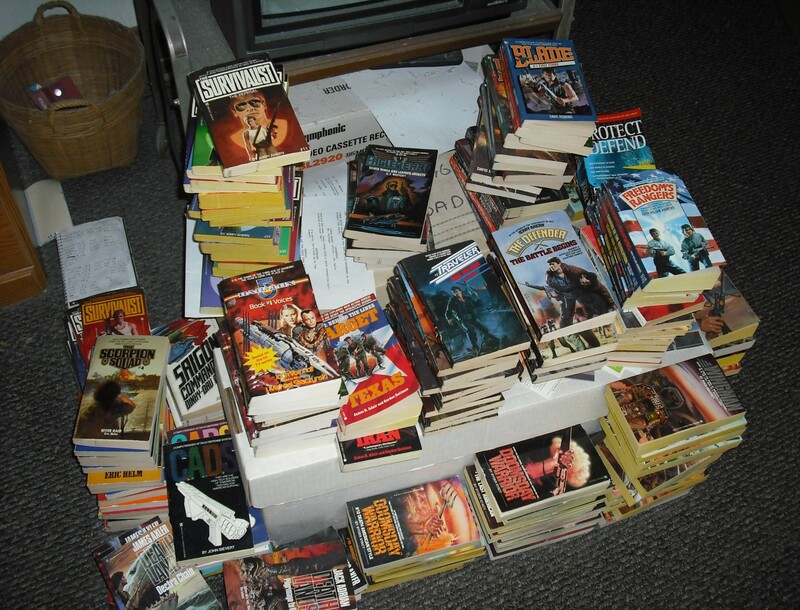 Rifts – THE BOOKS THAT TIME FORGOT. A group of travels stop for the night. 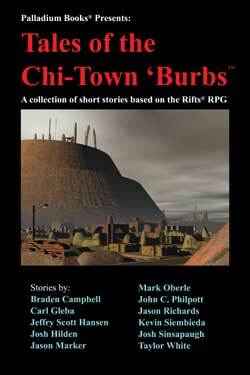 The mercenary leader wants to stop at the Chi-town ‘burbs where he claims is the best place on Earth. The leader wants nothing to do with the ‘burbs. For he has heard that they are crime ridden and unsafe. Erin Tarn a writer tells that the truth is somewhere in between. A young man comes with his brother to gain citizenship in Chi-town. No one ever told them that it can take years. While waiting his brother is robbed and killed. He takes a job at a local tavern. Eventually the owner retires and leaves him in charge. He makes friends with the local Coalition officer and names the place A While Longer. Seven years later he is still waiting. A man gets cybernetic eyes from a local chop shop. The eyes were taken off a murdered person and resold. Now the man has visions of the murder. He goes insane and claws his eyes out before he dies. The story of Ian Polovich. As a young man he joined the Coalition to defend Chi-town from the invading Federation of Magic. In those days the city was a democracy and had mages in its army. He falls in love with one who later dies. He then sees the rise of Emperor Prosek and the xenophobia against D-bees and magic. Disgusted with the changes he chooses to live in the ‘burbs and write his story. Peddler is a merchant who deals on the side in the black market. One day he gets a magical device called the Orb of Teleportation that can teleport anywhere. When a mysterious vigilante stops a corrupt Coalition officer from stealing from him. He finds the man and confides a plan to assassinate Emperor Prosek. The vigilante is actually a Coalition officer in disguise and kills Peddler and confiscates the Orb. Two D-bees those non-humans that came through the rifts get together and form a comedy act. They go to Tolkeen and after the war head on to Lazlo. They eventually wind up in the ‘burbs and do subversive acts against the Coalition and manage to form an underground railroad to help escaping D-bees. Ryall Seitz is a corporal in the Coalition army. He is involved in stopping terrorists from Tolkeen. One of the captured terrorists is his brother. This exposes him to the Coalition that Seitz is from another dimension and not born a human on Earth. Even though he is human and loyal the Coalition is paranoid about anything that comes from the Rifts. We are left that his fate is not good. A man joins the Coalition army to fast track citizenship for his family. He goes off to the war with Tolkeen. Later the wife hooks up with an abusive man. The son plans to kill this man. It is revealed that the man is actually his father who came back changed by the war. A bureaucrat who works at the medical records gets a message from someone in the ‘burbs. His grandfather has died and left him something. He goes and finds that he was murdered for the object. Only his voice can open the box. It is a magical spirit that can incinerate anybody. He forms a bound with it because they both share a life of misery. The man then uses it to take out his boss at work, thugs that have been stealing from him and his cheating wife. A bear like D-bee frequents a bar. He is liked by everyone and talks about baseball and this home down south. It is revealed that it was destroyed by the Coalition. A young girl hides a fugitive from the Coalition. A man who became a Juicer an augmented individual who is pumped with adrenalin and other chemicals to heighten his senses and response times. A jealous colleague sabotages his chemical unit and now he must work for a doctor in getting back the man’s stolen bag. He also has to stop this man from kidnapping his family and selling him to a mage. The owner of A While Longer receives news that his old friend the Coalition officer has committed suicide. He also finally gets his citizenship papers after nine years. He decides to stay in the ‘burbs rather than abandon his family and friends. This was an anthology of short stories about the ‘burbs. Those collection of shanty towns and villages that have grown up around the fortress city of Chi-town the capital of the Coalition States. For the most part these were very interesting stories. Only Going Home was the dud. War and Remembrance was an excellent brief history of the Coalition. A Juicer’s tale was also one of my favorites. I also have a soft spot for Me and Mr. Choke. I can sympathize with a poor guy stuck in a horrible job. On the whole this was a great collection of short stories. I hope that more books will be written about the Rifts universe. 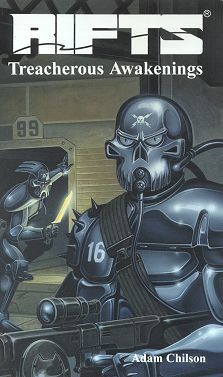 The third in the trilogy finds the Coalition squad under Sorenson back into the wilds to hunt down Zenjori Suka and his Army of the New Order. It takes them to the village of Liberty, Maryland. Sorensen has to fight Suka and his powerful well equipped mercenary army. He also has to worry about a Splurgoth slave raider from Atlantis. The biggest enemy comes from within. Captain Prichett is tasked by Colonel Lyboc to make sure that Sorenson and his men do not survive. The third book was fun to read. There was plenty of action with magic and cyborgs. 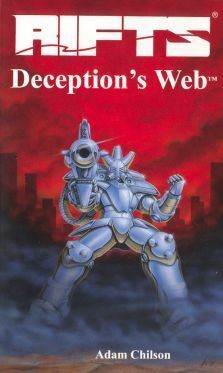 Some humor with a crazy Cyber-knight and a kooky shape-shifting dragon that liked to adopt the image of Mel Gibson. It also finally revealed the reason behind Zenjori Suka. He was hired to attack villages along the border with Tolkeen to make the Coalition military presence welcome. He also was to expose a fifth column movement whose goal was to overthrow the emperor and restore democracy to the Coalition. Zenjori had the names and proof that the Coalition was using chemicals in the food and water to mind control citizens. Which is why the Coalition wanted him hunted down. I liked the Rifts world that was created for the role-playing game. RPG games usually have very intricate and exciting worlds they create and I like the novels based on them. 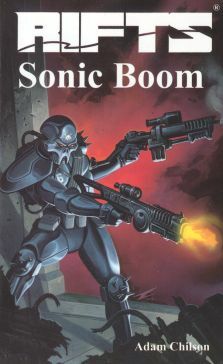 Its too bad that more books weren’t written for this series. There’s a whole world with Vampire Kingdoms in Mexico, Corporate superstate in Germany, a new continent of Atlantis run by magical creatures. Well the company is still in business and put out a anthology book. Perhaps they will write some more in the future. The Coalition squad under Lt. Mike Sorenson has launched a final attack on the Army of the New Order. Just when they were about to win an order comes over the airwaves to retreat. The victorious Coalition soldier are shocked at the order that allows the ANO to retreat. Sorensen claims he never gave this order. After fighting off a Federation of Magic attack the squad makes it back to Chi-town. Here Sorenson is arrested and put on trial for the order. Now his fellow squad must investigate the shadowy conspiracy behind framing their leader. The second in the Rifts trilogy was a much better book than the first. A well written story with action plus fair amount of intrigue. We get to explore the fortress city of Chi-town and its surrounding suburbs. An introduction to the Coalition culture with its xenophobic aversion to magic. The reorientation that many in the squad have to go through shows the paranoia that the Coalition views against all magic users and non-humans. We also find out that top Coalition officers set up the Army of the New Order with a Glitter Boy robot to show how dangerous they were and the need for a new robot. In effect they were justifying the purchase of this new robot and making tons of money in the process. The ANO has damning evidence which looks like what they used to escape the Coalition. It sets up the final confrontation that will be in the concluding book of the trilogy. A hundred years in the future a nuclear war will break out. The who or why is lost to history but it kills billions. The death of billions release an energy that goes into the dormant lay lines that encircle the planet. The energy causes massive natural disasters killing more and feeding more energy to the lay lines. Rifts open that let extra-dimensional beings known as D-bees into our world. Now three hundred years later the planet is an alien world. Many D-bees and humans now practice magic. There are also technologically advanced civilizations. One of these is the Coalition. Its capital the enclosed mega-city of Chi-town. The Coalition is ruled by Emperor Prosek and xenophobic about magic and D-bees. A new threat the Army of the New Order has attacked their borders with a Glitter Boy the most powerful battle suit in existence. A search and destroy mission is launched to hunt down the ANO and its leader Zenjori Suka. The Coalition unit heads into the wilds of Ohio in pursuit. Battling magical cults and other powerful creatures. The trail leads to Youngstown where the ANO has used magic and deceit to take over the town. This is the first in a series of books based on the role-playing game Rifts. Reading it you get the feeling that there is a rpg going on. The battle scenes deal with how many hits the character takes and how much is absorbed by the magical or body armor shielding. The book also is notorious for being the worst editing job ever. The editor made a real mess with misspelling and unfinished sentences. Still the book is an interesting read. Its mostly an action based story with a lot of battles. Magical beings and advanced body armor that can fly. Throw in a shape-shifting dragon, a techno-mage who joins magic with technology and mind control wizards you have one wild story.